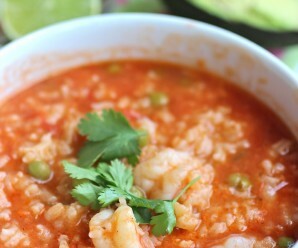 This is a wonderful dish to eat during the summer, but I love it so much that I serve it year round. It is healthy, refreshing and very easy to make. This Orzo and Shrimp Salad is perfect for a quick lunch. Bring a large saucepan of lightly salted water to a boil. Add the orzo and cook until tender, but still firm to the bite. Drain the pasta and set aside to cool. 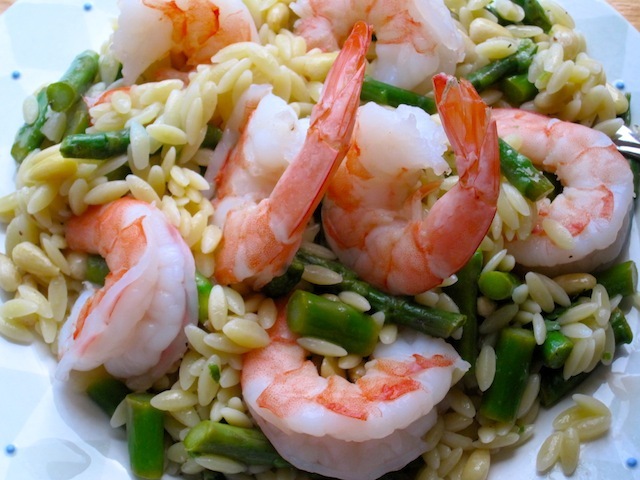 Place the asparagus, pine nuts, and shrimp in a large salad bowl, mix well and then add the orzo. Mix together the lemon juice, salt, pepper, sugar and olive oil in a small bowl. Pour the mixture over the salad and mix well. Keep in the refrigerator until ready to serve. I love shrimp and asparagus; and I love this dish. Very refreshing and flavorful. Have just discovered orzo and love it. Adding this one to my ‘gotta make’ list. 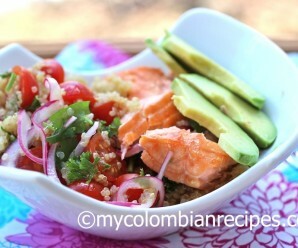 This colorful dish makes me think of spring! Very cheerful! I love the colours in this dish! And the huge pinky prawns make me drool! I have some orzo in my pantry. hmmm, no shrimp though, but I bet I could whip something yummy up since you made me hungry now! Oh I do so love this, the more lemon, the better! Sounds just about perfect, and it does look of summer – a feeling desperately needed around here. Thanks so much for this glimpse of warmth and sunshine! This looks like a very delicious and healthy lunch. Those shrimp are big! You’re right…sounds good for any time of the year. I love orzo – looks rice but tastes like pasta (because it is)! Oh this looks so healthy and delicious! Gorgeous! You know I always look at the boxes of orzo in the pasta aisle at the supermarket and I never feel inspired, but now I will be! I think the pine nuts (which I LOVE) are totally doing it for me! Beautiful salad–I buy a whole wheat orzo I really like that would work well in it. It has all of my favorite ingredients. 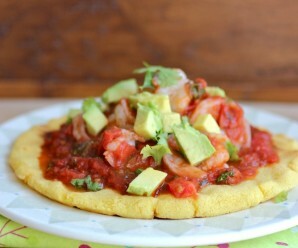 You definitely can’t go wrong with quick and easy meals like this! Yum. Shrimp and asparagus work so well together, it’s worth cheating and seeking out the asparagus even off-season when you have to pay a fortune but really want that incredible combination of tastes. I’d have to add a wee bit of oregano, though, because olive oil/lemon juice/oregano is my favorite way to dress a salad. That picture is scrumptious. What a bright and lovely salad, Erica! And low in calories too. Your photo is so delectable I could almost pick one of those gorgeous pink shrimp right off the screen! 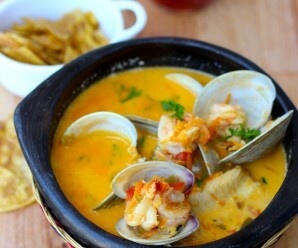 The photo looks beautiful and the recipe mouth watering. Thank you for posting it. I look forward to cooking it very soon. Sometimes the best dishes are the easiest… this looks good! This yummy dish would definitely make the perfect lunch! It sounds very refreshing and its pretty color has me wishing for spring! looks so yummy, can do all else with another pasta…but I miss orzo! yummm looks delish, and I love the colours!! Simple and divine. Love shrimp, and asparagus.. Beautiful, simple and flavorful combination. Hi, just today found this blog and I have to say that it looks impressive. I totally agree with your post. Have a pleasant day, keep up the nice work and I’ll definitely keep reading. I tried this recipe today. I had to change the recipe a little bit but it turned out excellent! The orzo with shrimp and asparagus was such a great idea! Loved it! I’ll be posting the recipe soon. I’ll make sure to link it back to yours! Thanks!